Setting up Bluetooth. Turning it on/off. We will work on the first case to view the current bluetooth status, turn it on or off. Our layout consists of just an image button and a text describing the status. We will change the image of the button based on the bluetooth status. If already enabled, we will show a green bulb. If disabled, we will show a red bulb. If blue tooth not available, we show a disabled grey button. 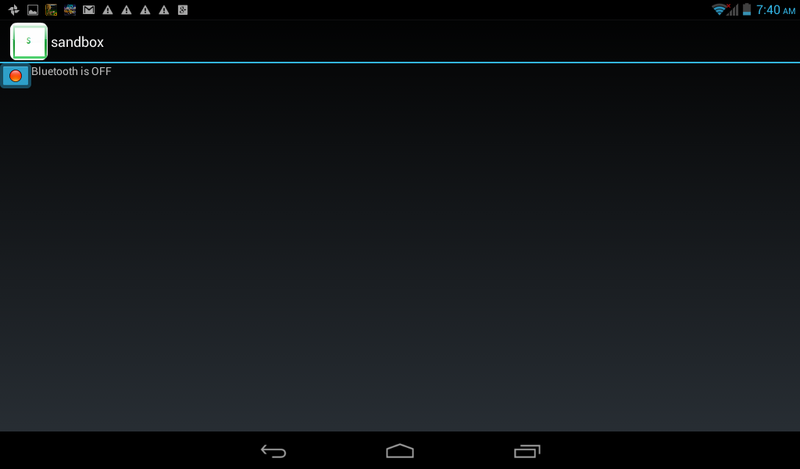 You will find all of the bluetooth APIs in the android.bluetoothpackage. The BluetoothAdapter is the entry-point for all Bluetooth interaction. First we need to get the BluetoothAdapter using the static method BluetoothAdapter.getDefaultAdapter(). This returns a BluetoothAdapter that represents the device’s own Bluetooth adapter. BluetoothEnableDisableActivity is our main activity. If bluetooth is not available, we will set the button’s image to a grey bulb. If bluetooth is disabled, the button will be shown as red bulb. If it is enabled, the button will be shown as green bulb. We also add a listener to the button so that one can turn on and off the bluetooth. Note that if bluetooth is unavailable, the button will be disabled. If getDefaultAdapter() returns null, then the device does not support Bluetooth in which case, we will update the image button to a grey bulb and set the bluetooth status to ‘Bluetooth is not available’. We have added a listener to the bluetooth button to turn on or off when pressed. 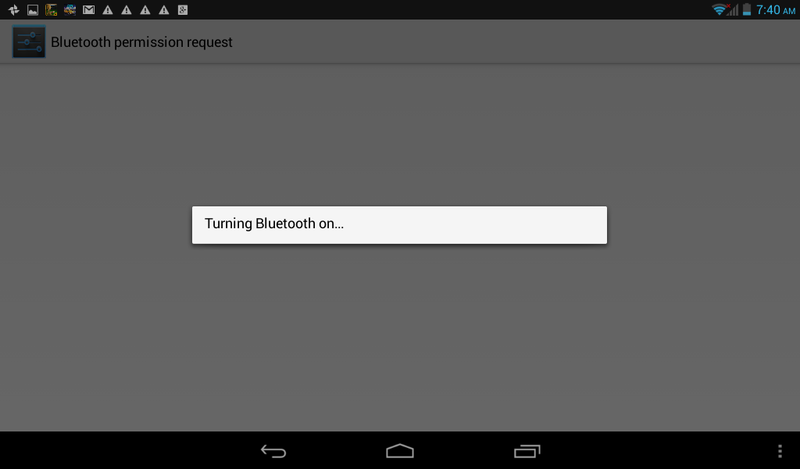 If the bluetooth is currently off then pressing the button will send a request to the system to enable it. We will use an Intent object to communicate with the bluetooth service. To request that Bluetooth be enabled, we will call startActivityForResult() with the ACTION_REQUEST_ENABLE action Intent. 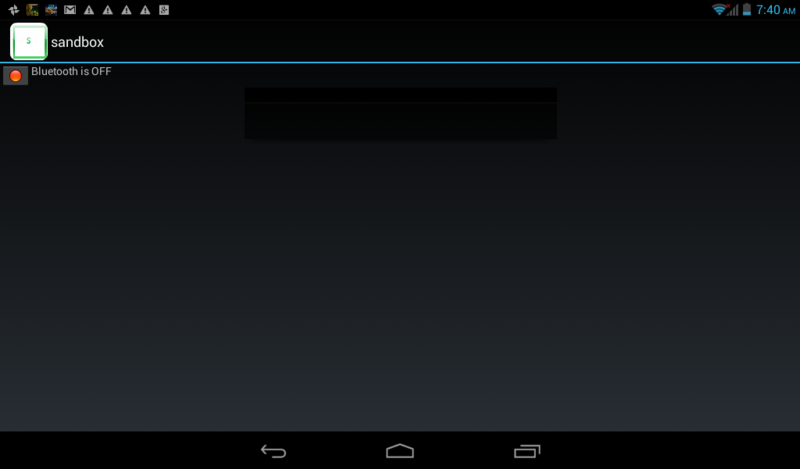 This will issue a request to enable Bluetooth through the system settings. A dialog will appear requesting user permission to enable Bluetooth. If the user accepts, the system will begin to enable Bluetooth and focus will return to your application once the process completes (or fails).On completion of process, callback method onActivityResult() will be called. It will have the the request and response codes as the argument values. We need to pass an integer (> 0) to startActivityForResult() so that onActivityResult() can compare the request code to know whether the reponse belongs to the same request. If enabling Bluetooth succeeds, your activity receives the RESULT_OK result code in the onActivityResult() callback. If Bluetooth was not enabled due to an error (or due to user clicking on 'deny') then the result code is RESULT_CANCELED..
Based on the result code, we will update the button's image and change the status. BluetoothAdapter.isEnabled() will let us know whether bluetooth is enabled. 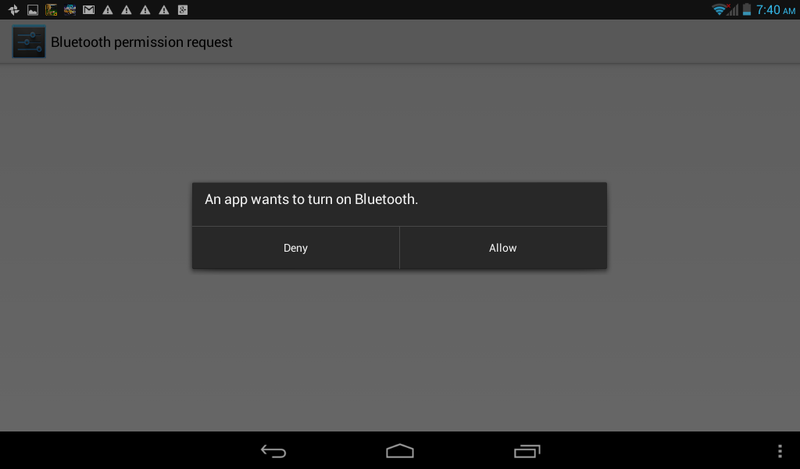 In order to use Bluetooth features in your application, you must declare the Bluetooth permission BLUETOOTH. Also we should add BLUETOOTH_ADMIN permission, in order to turn off the bluetooth. Also note that if we have to add BLUETOOTH_ADMIN permission then BLUETOOTH permission is obligatory. Initial Status Of Bluetooth. As you can see, it is off. We will now turn it on by pressing the red button. A dialog will appear requesting user permission to enable Bluetooth. We will accept it so that the system can begin to enable the bluetooth. Focus will return to your application once the process completes (or fails). Let's now turn it off.